I couldn’t stop myself. The radishes (watermelon, breakfast, champion, and daikon), kale (red and lacinato), mustard greens, turnips, leeks, snow peas, and English peas are all in the cold hard ground. And the miraculously overwintered spinach has a new home and place of honor at the front of the house. Surely, this is a huge mistake. 2016’s tomatoes were incredible, amazing, prolific, and enduring. And honestly, I didn’t do a thing. Stakes collapsed, proving entirely insufficient for the task, the previous year’s wildflower offspring snuck up between the vines and I didn’t have the heart to stop them, and I watered when I remembered. Fruits were smushed by the alley’s traffic but it was totally fine because there were plenty more on the vine. Tomato-devouring squirrels lived in fear (or died by the dozen). I’m pretty sure the garden cat did more for the tomatoes this year than I did. Happily, tomato-devouring squirrels lived in fear (or died by the dozen). I’m pretty sure the garden cat did more for the tomatoes this year than I did. This year, however, we’ve got big things in store for our tomatoes. Bed 3 will feature a purpose-built tomato support system, a first for POD. 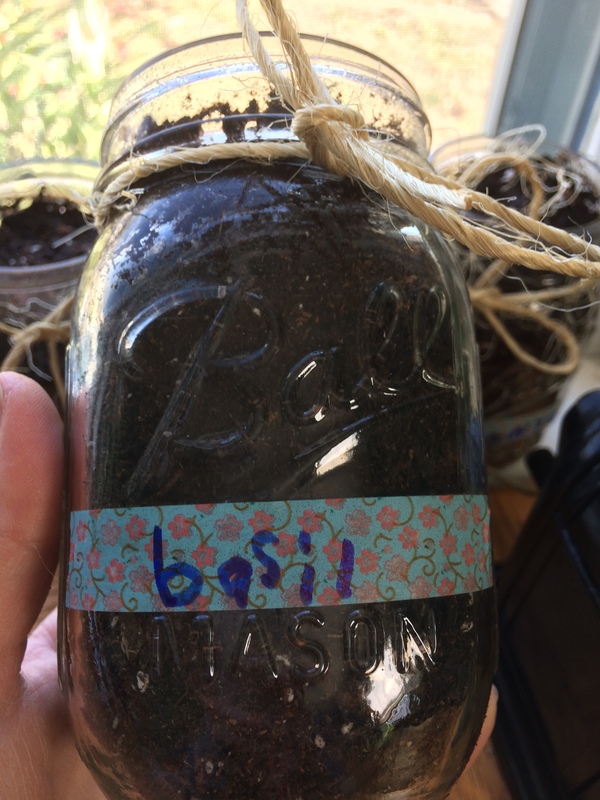 In addition to Jelly Bean, Easy Sauce, Orange Whopper, and a volunteer (which we’re sure to have), we’ll plant a few basil plants and marigolds. I’m pretty sure the Russians are going to be taking over the Kroger by the time spring rolls around, so January feels like a great time to get my head straight and garden plan on. It’s a brand new world, good garden people. As I type, a grand garden shed is being erected in the back 40 (more on that later) with plenty of room for tools and just enough room for out-of-towners. 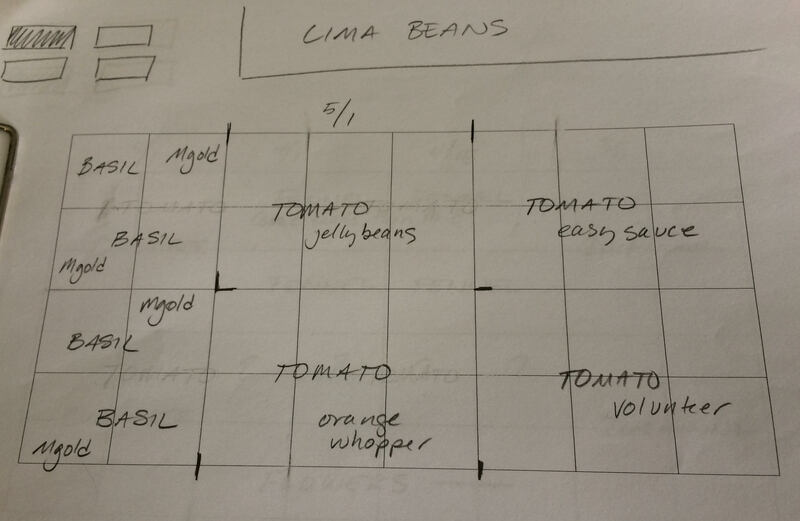 We’re expanding to four, count ’em FOUR, 4×8 beds this spring which means all sorts of fun. Undoubtedly, I’m being over-ambitious here, but hey, a gardener’s gotta’ dream. The first bed features early spring goodies. Nothing terribly earth-shattering in this particular bed, other than one last (I swear) attempt at growing something in the brassica family. After suffering a series of catastrophic cauliflower, broccoli, and Brussel sprouts failures over the years (thanks for being so dependable, cabbage loopers and stink bugs, you’re the best! ), I swore I was done. Then the Endurer hit me with puppy eyes and we’re giving romanesco a shot. We haven’t seen one of these fractal beauties since fleeing the East Coast. I thought Nashville was the next “It” city. Come on y’all, get with the program. 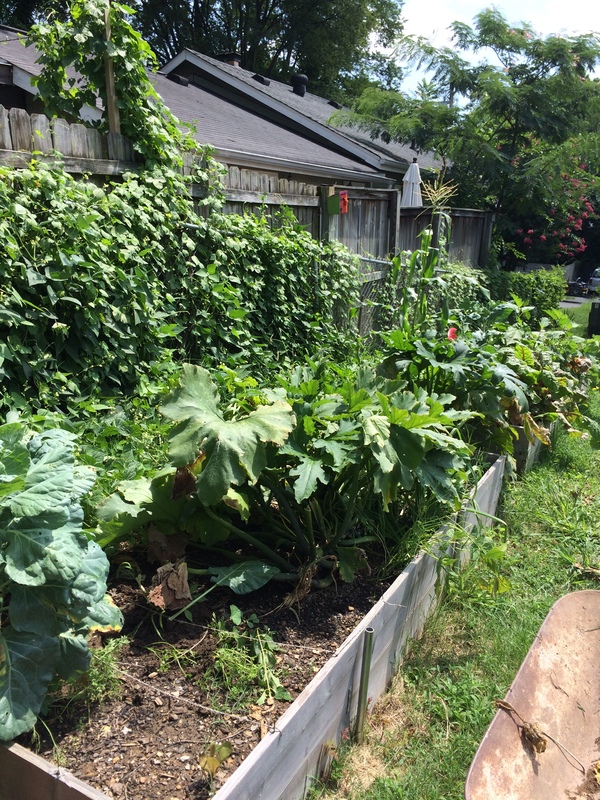 Last year’s garden was a largely a success, despite a shocking amount of neglect. Despite totally insufficient staking, four varieties of tomatoes flourished through early November, with the last of the green tomatoes ripening and becoming a delicious late December sauce. And happily, for the first time in POD’s history, an almost sufficient (the Hurrican and I really, really like beans) amount of green beans hit the table. The only complete failure were the cucumbers, which quite immediately contracted a blight and died after one round of prolific fruiting. This year, one of POD’s many ambitious resolutions (ranging from chestnuts like exercise more and snack less to unicorns like slow down and smile more) includes paying a bit more attention to both the tiny plot of Lockeland Springs land and then actually writing about it right here in this here blog. 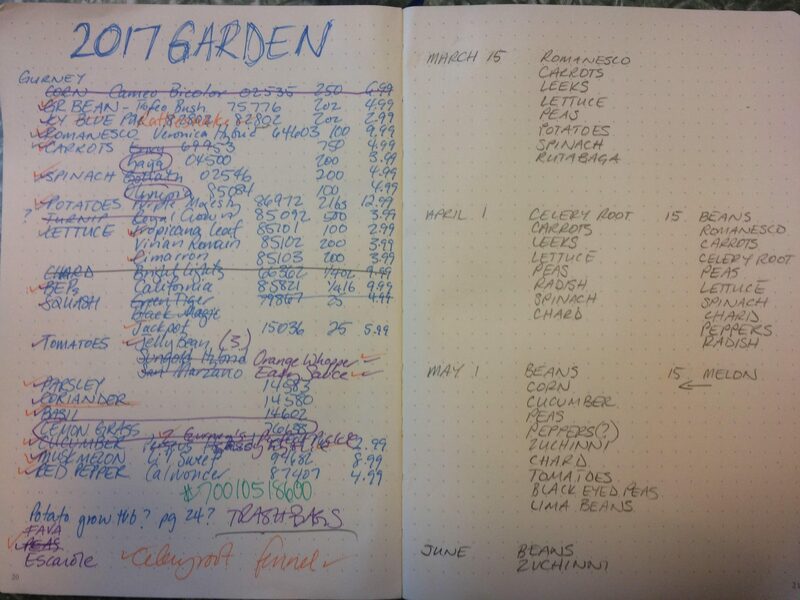 Plants on Deck: Garden Planning 2017, Making a List. So much has happened in gardenland this summer that it’s been tough to keep up. Despite so-so attention, the summer garden was a one family CSA. Alas, it’s on the wane, and we’re digging in for the fall. Zucchinis have been uprooted after six solid weeks of zucchini meals four nights out of seven. The four cucumbers caught a wilt and produced a meager dozen of fruits. Note to self: lemon cucumbers may be Nana’s favorites, but they’re not ours. Wow. Behind on posts these days. But here’s the thing: we had a great spring for greens. The two beds produced well, but we’re still figuring out how much to plant and when. So, file this away in the “Note to Self” department: go greens crazy in March. We planted a two squares of arugula and spinach and four squares of lettuce. Not enough. Cover the beds with arugula and spinach, scatter in a few square of lettuce, but go for the greens. They’ll be ready to yank by the time May planting season rolls around in earnest and the freezer will be well-stocked with arugula pesto and my craving for saag paneer will be sated. We love arugula around here, but never had the space to grow enough to do much beyond topping a few sandwiches. This year two square feet of garden space produced plenty of sandwich toppings, salad spice and three cups of arugula pesto. That’s a lot of rocket. Planted in early March, the Selvatica arugula had just started to bolt when the craving for pesto hit hard. The entire patch was plucked and pesto was pounded. As this is apparently a smaller, wilder form of the tangy green, it’s a bit more heat tolerant, so we’re reseeding today, hoping for one more crop. Note to Self: Although we did a much better job planting both beds with spring crops this year, I’m going all in next year and plan to plant an abundance of greens in early March, using each available square foot. It’ll take some fortitude, but when it’s time for summer planting, I’ll get all ruthless and yank them to make way for beans, zucchini, melons and corn in late April.